Knocklyon United may lose their Ballycullen Park pitches to council development. Up to 400 children could lose out on the opportunity to play football for their club as Knocklyon United may lose their Ballycullen Park pitches to council development. The club has used the grounds to house 400 children who play for their U-7s up to their U-12s but face losing it if a council proposal to build social housing on the land is successful. A tender went out yesterday for the construction of 42 social housing units on the land, and according to the Knocklyon United Head of Football, Dave Dunning, if the development goes ahead the club's future could be in danger. "The bigger picture is that the club could fold," he said. "We’re a growing club. I have a waiting list of kids to get into the club, we already don’t have enough room. If this area is taken off us, the lifeblood of the club will be gone because it’s where all the junior clubs play. You don't’ start a team at U13 you start it at U7. "So we’re looking at it, the club could go, the club could fold." Dunning was in Ballycullen Park on Sunday watching on, as every team from the U-7s up to the U-12s were playing DDSL matches. He was joined by other volunteers to tidy the club, paint walls, fix up the pitches and prepare the grounds ahead of their upcoming Mini World Cup. In what Dunning described as a community affair, it isn’t rare for members of the club, without any family members playing, to come and support their youth on a Sunday morning in the Park. They care greatly for their youth and Dunning worries that without playing facilities, the lives of the children would be greatly impaired. "You look at every angle on it," he said. "You’re looking at kids’ social skills, obesity, mental health. In relation to the community, we’re here since 1984, we’re growing. If this is taken away, you're looking at the guts of 400 kids under the age of 12 with nowhere to play. "They don’t have a local solution within the boundaries of Knocklyon. I manage an U15 team. It’s the only sport they play. They play football because they love playing football." Knocklyon United have not had it easy. Since the club’s foundation in 1984, they have had the M50 built through their pitches, a school built on another site they were using, and now, the pitch that houses the future of the club will likely be taken. The club was happy to take their earlier knock-backs on the chin and despite the uncertainty, have managed to develop into a Dublin stronghold. With over 600 members, they are one of the biggest clubs in the country. The newest proposed development, however, is not the first problem that the club have had with the council according to Dunning. The passionate Head of Football recalled the council agreeing upon the building of a shared astro turf between the club and the local Gaelscoil. 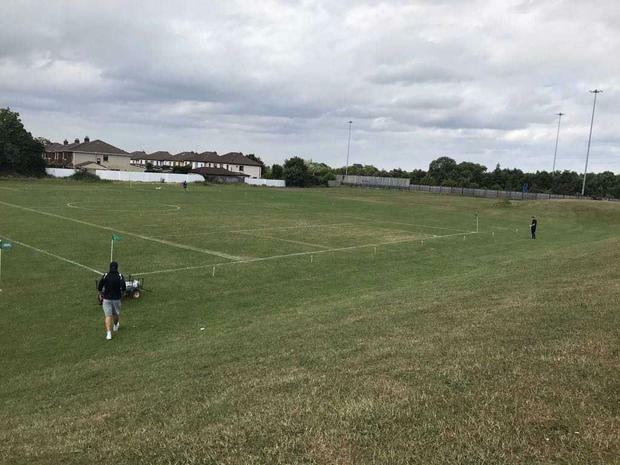 When the plans were made, however, the council appealed the size of the playing area and it was refused by an Bord Pleanála, after the club had already spent around €25,000 on the planning. Dunning feels that Knocklyon United have received the short end of the stick when it comes to support given to local sports clubs. While he respects GAA clubs in the area for their ability to expand their facilities, he can’t help but feel envious of the treatment, he feels they receive from the council. "I think the local GAA club have 26 pitches if I’m not mistaken. I really admire them for what they do and how they conduct business," he said. "They have the finances to back it as well. We’re not in their league. They’re doing a fantastic job but I’m standing looking across the road at four Gaelic pitches. If that was us it would be ideal. But that’s never in a million years going to happen. "No one is ever going to take stuff off the GAA clubs, it just doesn’t happen. We’re just hard working volunteers trying to do best for the kids and we have no avenue for opportunity with them (the council). We’re always getting knocked back." Across the road from Ballycullen Park is Woodstown Village Estate. When the estate was built, the developer was granted permission to increase density from 400 to 600 houses on the condition that the land across the road, where Knocklyon United are situated, was given to the council specifically as Class A amenity green space. The South Dublin County Council made no comment on the proposed development but Councillor Deirdre O’Donovan is steadfast in her efforts to help the club hold onto their pitches. She said that the area is over-developed but lacks infrastructure for the local youth. This development would be a repetition of mistakes previously made by the council and a further step in the wrong direction, she says. "I am spearheading the campaign to save our pitches in Knocklyon," she said. "Every week we have 600 boys and girls who are using these pitches. We’ve had so much development over the last few of years. We’re going to have 4000 new housing units between Old Court and the end of Stocking Avenue and 400 of those are going to be social housing units. "Where are those children supposed to play? We feel that there is a complete lack of investment on behalf of the council in our area. They need to be giving more sporting facilities to the community, not taking them away." "I’m at the coldface of the housing crisis and I completely accept that (there is a need for social housing) but we cant keep making the same mistakes,” she added. "This makes absolutely no sense. It’s not a social housing issue. We are losing vital amenities and sporting facilities. There are over 7,500 children in Knocklyon and its surrounding areas with one community centre, one community centre paid for by local residents." Because the proposed houses are social housing units, the council do not need to apply for conventional planning permission. Instead, the plan comes under a 'part 8' development and is voted upon by the council. The vote for this proposed development is expected to take place at the end of this year and Cllr. O’Donovan said that she expects the outcome to be "very tight".